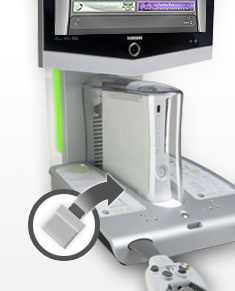 Remember the Xbox 360 Retail Kiosks, and all of the hype they delivered? Exclusive Gamerpics, Demos, and I thought I heard something about a special achievement, back during the Xbox 360 Launch. Much of this was before my time, and I’ve never had much face time with these Demo kiosks… but for t hose of you who always had the intention of snagging any downloadable goodies for the kiosk, now is the time. I was recently contacted by a games store manager and told that an update disc is being mailed out for all of these stores, and the “Xbox Retail Experience Demo” (XRED) 5.0 will be installed on kiosks accross the country very soon. Update: International readers have contacted me and confirmed this thing seems to be global. Whether this new demo will include any downloadable goodies like the others, I was not told. What we do know is this new demo show cases the NXE, and encourages users to create their own avatars. This disc will actually install the NXE dashboard to the console itself, as well as include the traditional demo disc goodies – so expect to hear quiet rumblings of more “Red Ring’d” or “E74” retail kiosks in the coming weeks.